on November 22, 2017, 12:50 a.m. 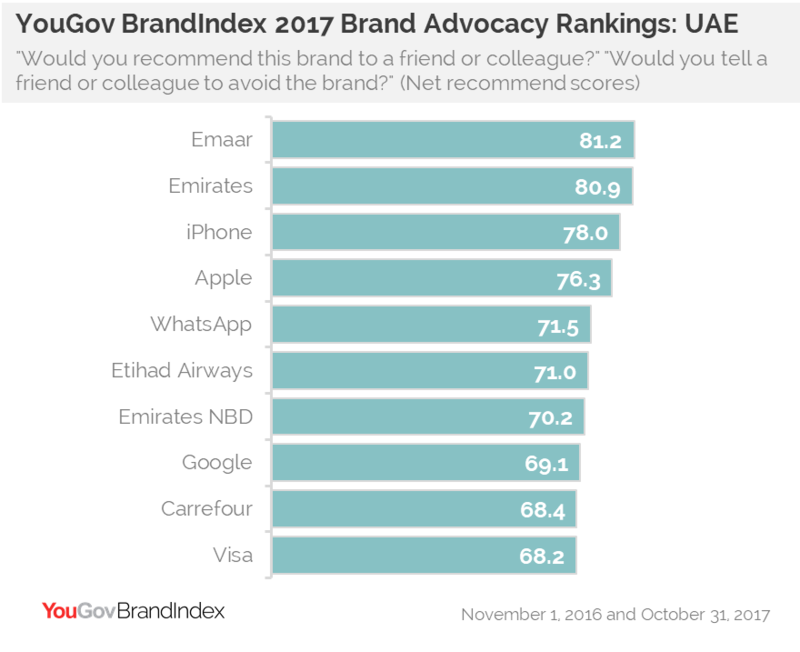 According to the latest brand rankings from YouGov BrandIndex, Emaar, Emirates and iPhone are the number one brands consumers are most likely to recommend to friends in the UAE, Saudi Arabia and Egypt respectively. Having developed some of the country’s most iconic entertainment attractions, hot spots, hotels, malls and residential and commercial communities, Emaar has produced consumer experiences that have helped to shape the UAE’s popularity as one of the leading destinations of the world. The rankings demonstrate in the past 12 months the Emaar experience has made the biggest lasting impression on UAE consumers, enough to make them endorse the brand the most to others. Behind Emaar, the UAE’s top 10 most recommended brands include three other home-grown brands with national airlines Emirates and Etihad Airways securing second and sixth place respectively, while Emirates NBD comes in seventh. 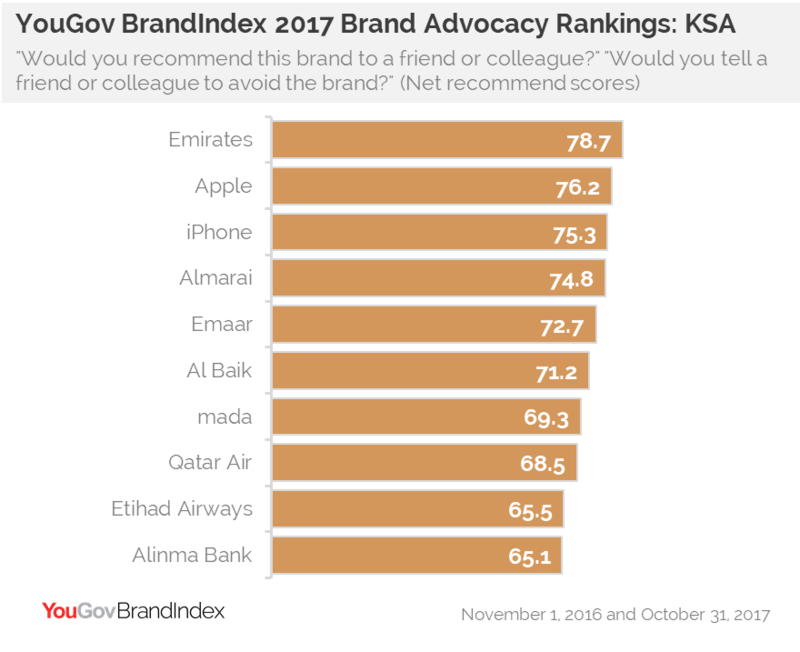 Responses recorded over the last 12 months from Saudi residents reveals that Emirates received the highest brand advocacy in the Kingdom taking the number one spot in the top 10, ahead of fellow highly recommended airlines Qatar Airways in eighth and Etihad Airways in ninth. Emirates has been serving Saudi Arabia for over 27 years and operates to four cities in the Kingdom. The past year saw the airline produce special fares to the country and a very special video message with football team Real Madrid to congratulate Saudi Arabia on its 86th National Day. Apple and its trademark iPhone sit in second and third place respectively, again giving them the highest seal of approval among tech and mobile brands in the Kingdom. Meanwhile Saudi FMCG powerhouse Almarai is the fourth brand most recommended to friends among Saudis, and UAE-born property developer Emaar sits comfortably as the fifth most endorsed in the country. Al Baik is the most highly commended fast food brand among Saudi consumers in sixth place, while Saudi electronic payment network mada, and banking house-hold name Alinma Bank lead brand advocacy among financial services brands in seventh and tenth place respectively. In its tenth anniversary year, 2017 has seen three new iPhones launched to a healthy worldwide reception. 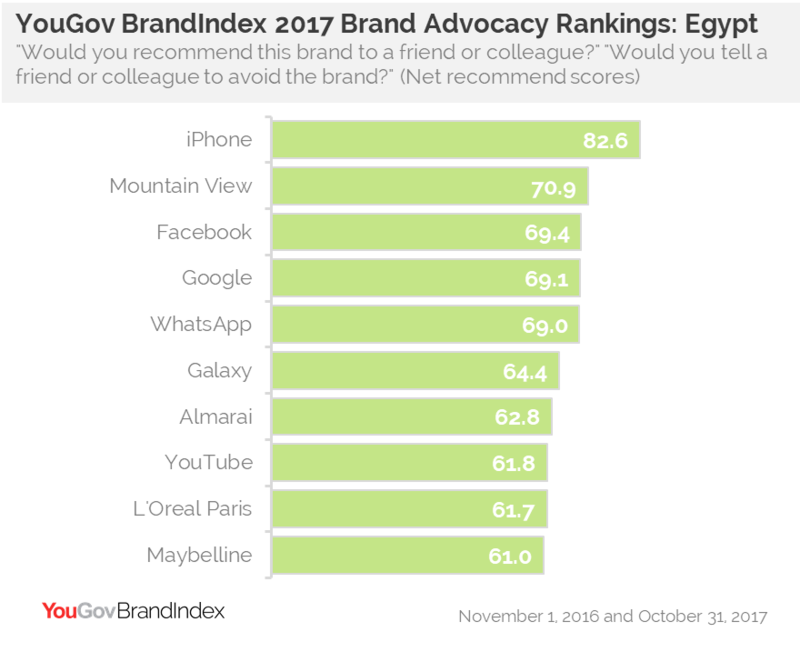 Having tracked the brand’s advocacy over the last 12 months, BrandIndex can confirm iPhone is the most likely brand to be recommended to friends among Egypt residents. The second most heavily endorsed brand in the Egypt Advocacy Top 10 is established Egyptian real estate developer Mountain View. Digital based brands take up another four spots with world social heavyweight Facebook, search giant Google and instant messaging phenomenon WhatsApp in third, fourth and fifth respectively; video sharing platform YouTube stands in eighth. Galaxy, in sixth, and Almarai in seventh represent the most highly endorsed FMCG brands over the past year in Egypt, while L’Oreal Paris and Maybelline round out the top 10 as the most highly commended make-up brands among Egyptian consumers in ninth and tenth place respectively. How much do consumers advocate your brand? Contact Head of BrandIndex - MENA, Scott Booth to find out. For this ranking, YouGov BrandIndex screened 546 brands in the UAE, 496 brands in Saudi Arabia and 287 brands in Egypt for their net Recommend score, which asks respondents "Would you recommend the brand to a friend or colleague?" and “Would you tell a friend or colleague to avoid the brand?” Only respondents who are current or former customers of a given brand are interviewed. Data was collected between November 1, 2016 and October 31, 2017 on brands that had been tracked for at least 6 months with a minimum sample of 500.